Yesterday’s Playground Jam went ahead despite the bad weather reports of high winds and snow storms. We arrived at 8.30am to a park bathed in sunshine and looking amazing, the top jump was built up and looked super fun, the rest of the park was looking great too, with rail and box lines as well as 2 sized kicker sets of 3. We set up and waited for the girls to arrive, by 10am there were 16 snowboarders and 5 skiers signed up and practicing their stunts on the course. The wind turned out to be a little bit of an ‘issue’ I told the girls to make sure they kept safe and only rode the stuff they felt was going to give them the most fun, I knocked myself out last week taking a kicker in the wind at the British Slopestyle Comp, NOT FUN, I have never realised how much the wind can affect you, it’s a VERY dangerous element that needs to be respected, wish I’d known that before I took a 20meter kicker in a high crosswind! haha, still here to tell the tale, so that’s ok! The girls were able to handle the wind and the sun even shone for most of the days competition which was a very welcome sight as it felt bloomin’ baltic up there! We wrapped up the days comp early, expecting an imminent snow storm, everyone got 5 runs each and we judged the placings from those. Then we met at the bottom of the park for sandwich, cakes and prize giving. The judges had a hard time of it, everyone rode well and with the ‘mitigating circumstances’ it was really hard to tell who most deserved placings, the top 3 in snowboard were pretty clear to see though and the ski judges said the skiers were pretty easy to place, but it should also be said that on a perfect park day, the placings could have been very different, the top girls all battled through the weather and managed to stomp their stuff because they are super solid riders, a few of the others kept it safe and didn’t want to ‘tempt fate’ trying things in the wind. This is the essence of competition though and what keeps them interesting, hopefully the sun will shine next year to give the other girls a chance to really shine too. 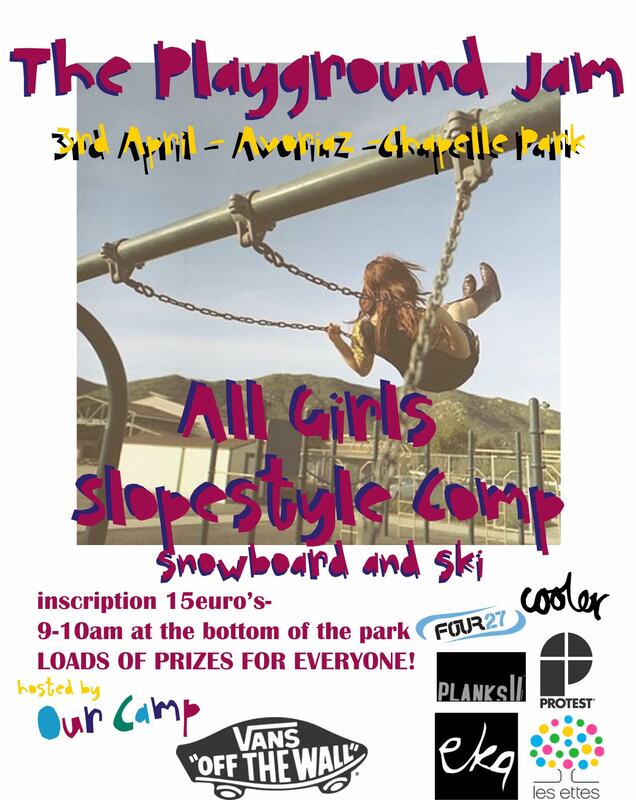 Our Camp would like to thanks everyone for supporting us and helping us put on the competition, extra special thanks goes out to our sponsors and the Avoriaz Park Team.